The Flex system can be configured with any of the current Graphtec large format scanner models and a wide range of of large format printers from Canon, HP, Epson, Encad and Seiko. 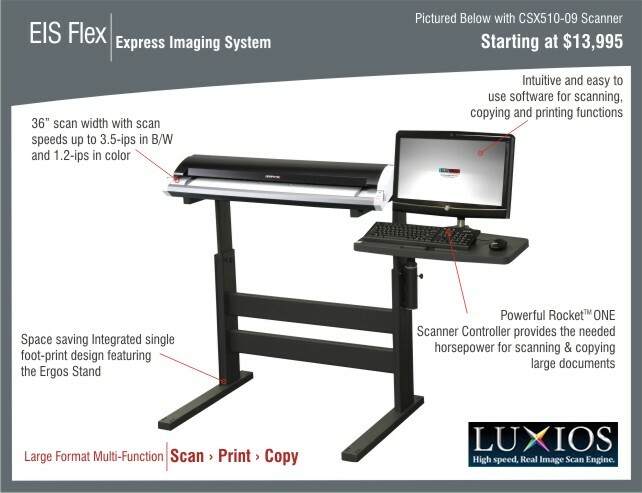 Use the Flex system as a stand-alone scanning station or add a Flex system to your existing large format printer to get a complete large format scan, copy and printing solution at a very economical price. The Flex system stand is adjustable to accommodate different printer heights or adjust the scanner height to the lowest level (36") and use it as a stand-alone scanning station. Eight different Graphtec scanners are available so you get maximum flexibility to meet your scanning, copying and printing needs.